But here is the trap: people tend to view BPM as an ocean of opportunities where almost any course may be charted. While in reality it’s rather a railroad line named “BPM maturity scale”. Knowing the map of this line is absolutely critical because the process maturity is a part of company’s culture so it can’t be picked up arbitrary or changed easily – only step by step. One should honestly evaluate at what station the organization currently stays and then buy a ticket to the next one. Taking what seems to be a short way may derail the company’s BPM train. The maturity model comes in many flavors: Gartner has one, Forrester has another, Carnegie-Mellon SEI has CMMI. The BPM Common Body of Knowledge by ABPMP refers all these plus Michael Hammer’s PEMM plus introduces its own model. While being in consensus on what the topmost level is, different models propose slightly different paths to the “process nirvana”. 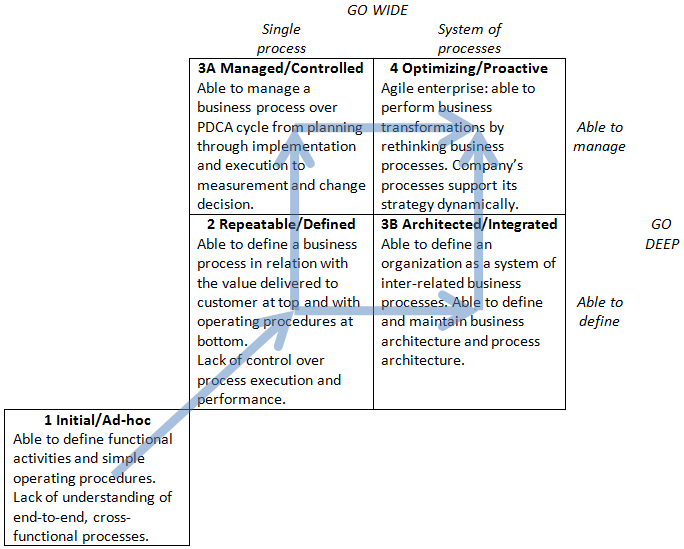 “Go wide” – increasing the scope of process work: from selected priority processes to the system of processes constituting the enterprise. “Go deep” – increasing the degree of control: from basic process documenting to structured definition to full management of the business process lifecycle with strong emphasis.